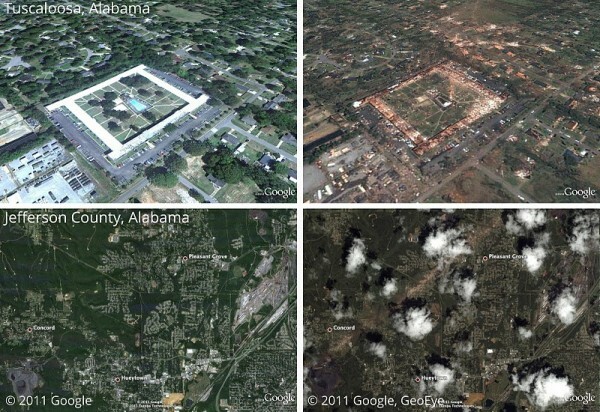 Google has posted before-and-after images of the terrible devastation left behind by the tornadoes that hit the South earlier this week, with close-up views particularly of Tuscaloosa, Alabama. The easiest way to see the images is through a Picasa album that the company has posted. It explains more about these here. Below is a montage photo of befor ..read more.. This entry was posted on April 30, 2011 at 12:54 pm and is filed under Uncategorized. You can follow any responses to this entry through the RSS 2.0 feed. You can leave a response, or trackback from your own site.